The moon and sun do not rise and set in the same place as some 4,000 years ago due to precession of the Earths' axis. The value of ε (the obliquity of the ecliptic or the tilt of the Earths' axis) has for the last 4 or 5,000 thousand years been decreasing at a rate of about 2/3' arc per century. (It can be accurately found from the de Sitter formula). Thus the sun & moon no longer rise or set where they did in the past and so any suspected alignment has to be reconstructed. 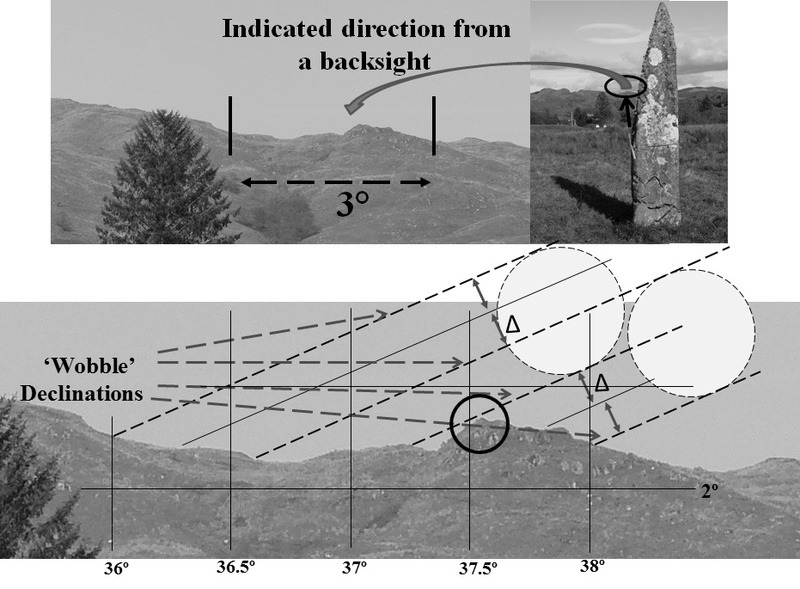 This is done by using a theodolite to measure the azimuth and elevation of horizon features as indicated by the orientation of the standing stones. These values can then be used to determine the declination of the features and compared with the sun and moon declinations for the period in question. Alexander Thoms' work showed that if his results were not due to chance, then the alignments 'fitted' for dates around 1700BC in the Early Bronze Age (Thom 1971 pp 36-44). The adopted extreme maximum declinations for the moon are, at the Major Standstill, ± 29° 03'.0. i.e. for ± (ε + ί ), and at the Minor Standstill, ± 18° 45.6'. i.e. for ± (ε - ί). As explained before an alignment consists of a backsight with an orientation (e.g. a flat sided stone) and an foresight feature usually 2-3km distant. e.g. a peak or a notch. True north is accurately fixed by sun observations. (See below). Using this information an azimuth/ elevation grid is superimposed on a b/w print-out of the horizon. 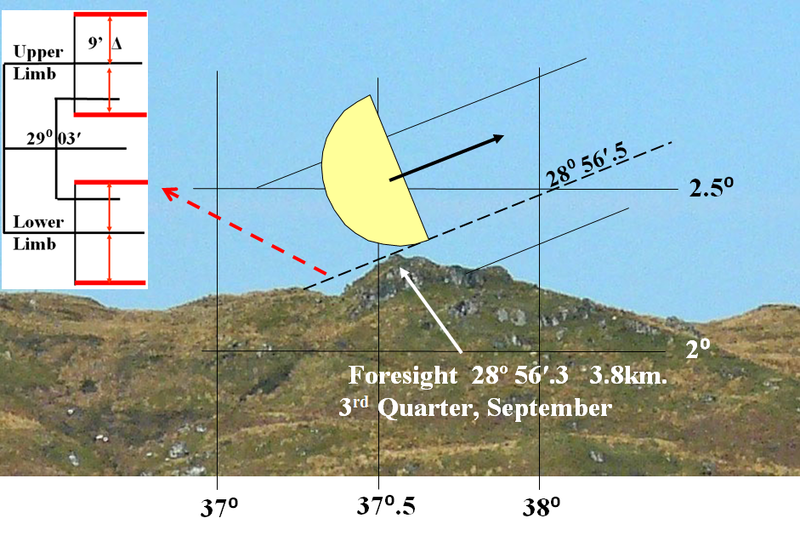 * A computer programme GETDEC4 **, available on Clive Ruggles website, is used to determine the declination values for the moon (or sun ) and the path drawn to scale on the same photograph. Any probable alignment will be clear to see. The azimuth/ elevation measurements for this feature are then used to determine the declination which is compared with the expected value(s). An accuracy of measured declination of about 1' arc or better is believed to be obtained. All sites received multiple visits over a 3 1/2 year period to check/recheck earlier findings. (*Initially this is drawn in pencil, but the final version is tranferred to Powerpoint for publication). (** This programme allows for refraction and gives readout with/without lunar parallax. The currently available programme is 16 bit which may not run on recent computers). 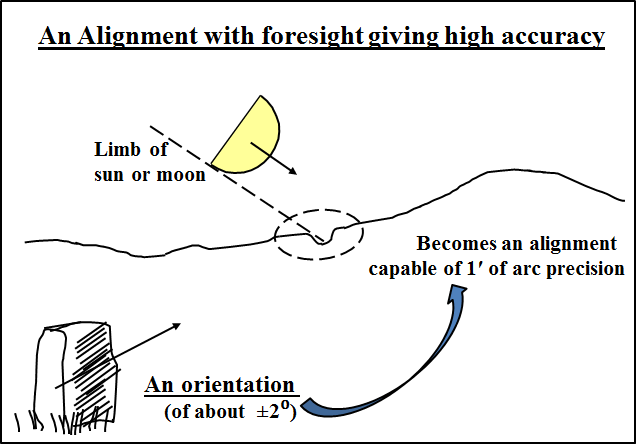 The following two figures explain the method used to find indicated foresight features if they exist. are a slope parallel to the moon’s path or a distinct point, e.g. a peak or notch. would enable warning of the moon’s approach. are well separated from any other usable and distinct feature which might be confused with the foresight intended. It is important to emphasise that the foresight features have not been “chosen”. If they are there, then the method finds them. i.e. the features originally used are rediscovered. An electronic Pentax theodolite (ETH 120F) giving readout to 20" was used. Observations of the sun are used to determine true north and hence by difference the azimuth of the RO. These consist of a bearing for each limb of the sun (with time for each to within 1 second) and later taking the mean. Three or four such pairs of observations would normally be made over about a five minute period. Using data from the Nautical Almanac and standard formulae each of these sets is reduced to an azimuth. (i.e. angular distance from north going clockwise). The 'spread' of these values would be expected to be 0'.5 or less. The azimuth of the RO (and hence of all measured features) is determined by difference.